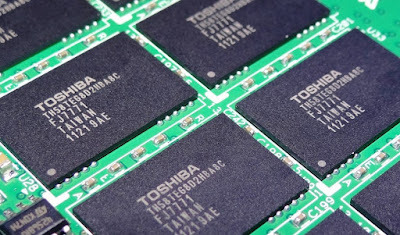 Last week, shareholders of Toshiba Corp (USA) (OTCMKTS:TOSBF) voted to approve the separation of the company’s NAND flash memory business, with the intention of attracting outside companies and initiating what amounts to, essentially, an auction of its most valuable asset. That negative equity was the result of a $6.3 billion write-down, which apparently stemmed from “accounting regularities” and “overstated profits” of more than $1.2 billion and ultimately led to the resignation of the company’s chairman. With no alternative options, the proposal to completely sever and sell the flash memory business was put to a vote, with more than two-thirds of shareholders approving the proposal. Toshiba’s NAND flash memory business has been described as the company’s crown jewel, and rightly so. In 1984, Toshiba invented flash memory and in 1989 released NAND flash memory chips. Simply put, NAND flash memory is “non-volatile storage technology that does not require power to retain data.” This technology has become the international standard for temporary data storage (i.e., USB thumb drives, MP3 players and other devices where files are frequently overwritten). As you can imagine, the number of companies that would love nothing more than to get their hands on Toshiba’s NAND business is massive. Companies from across the globe have lined up, with bids coming from private investors, investment funds, other chipmakers, as well as a number of tech behemoths. According to Business Insider, there are currently about 10 potential bidders interested in Toshiba’s NAND business, including the Japanese government itself, South Korean chipmaker SK Hynix, Broadcom Ltd (NASDAQ:AVGO), Western Digital Corp (NASDAQ:WDC), Micron Technology, Inc. (NASDAQ:MU), Apple Inc. (NASDAQ:AAPL), Amazon.com, Inc. (NASDAQ:AMZN) and Alphabet Inc (NASDAQ:GOOG, NASDAQ:GOOGL). Acquiring Toshiba’s flash memory business will allow the winning bidder to either design and manufacture its own memory chips, or gain influence — and profit — from the existing international ecosystem. Existing chipmakers such as MU would gain “an immediate impact on pricing,” as well as increased market share. Micron would have a chance to become the sole provider of NAND flash memory to companies such as Western Digital. Further, MU would have significant influence that could threaten WDC’s current advantage in the chip market. Currently, this entire debacle regarding Toshiba and the sale of its NAND flash memory business is difficult to use to any real advantage. This is simply because there’s too much still left up in the air, and until a deal is finally announced there’s not much to work with. There is, however, significant potential for volatility and upset in the technology sector, specifically the companies involved in making memory chips, as well as those that rely heavily on those components. That list is massive, and the fallout from the sale of Toshiba’s NAND unit has the potential to shake up more than a few existing business relationships. So for shareholders of the major players currently involved in the bidding, the only thing to do is hurry up and wait. But keep an extremely close eye on how this story unfolds, as share prices are likely to change rather quickly — even if those spikes or slumps are short lived and reactionary.